What comes in a jar? And keeps you full till lunch? 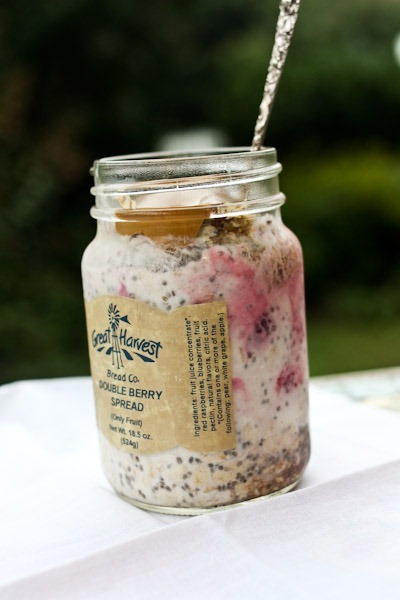 Overnight oats in a jar – mixed with frozen raspberries and blackberries (that thawed overnight), chia seeds, cinnamon, 1/3 cup oats, milk, yogurt, pinch of salt, Cville Crunch granola crumbles and sunflower butter. Whew! You know that bee who lives in our mailbox? Well I think he’s really a wasp or hornet or something. He’s HUGE. His head is the size of a praying mantis. I often look for him in there and today I looked in and he was working on something, looked up and stared right at me. Scary humanlike bug! Still dreary here so I’m putting on some beachy oldies to lighten the mood! Brrrr. No Illinois called for warm oats today. PS don’t let the wasp find out where you’re moving! Mmm…GH double berry spread? Yes, please! Wow, that is quite the mix in the jar today! We had a wasp (actually a whole nest) living in our bbq over the summer, and finally my roommate got up the courage to whack it out so that we could finally start grilling food without having to worry about being stung. Hope you can sort out a solution soon! Yummy!!!! Have a great day! I saw the Biscoff spread at the grocery store yesterday and had to try it. All I can say is HOLY YUM!! It made me think of you and now I understand why you love it so much! Forget Einstein, whoever came up with the idea of OOIAJ is a genius!!! What’s Biscoff spread exactly? Never heard of it! It’s a blend of Biscoff cookies and oil. it’s not a health food! untrue. it’s a mental health food! Mmm… a pillow top. I like the sound of that. Maybe a bit too much. zzzzz… I’m so sleeeepy this morning. 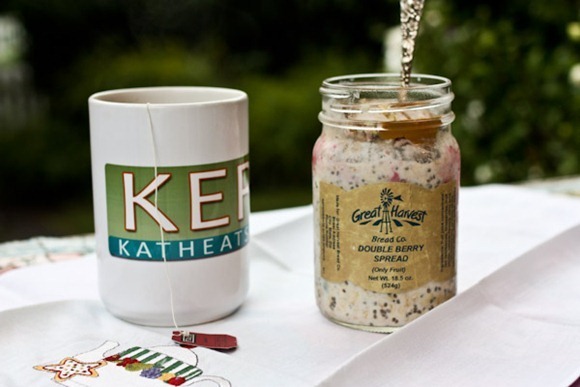 I haven’t had overnight oats in a looong time – time to break them out again. Even with the cooler mornings, I find OOIAJ sooo satisfyingly yummy. They seriously can’t be beat. Hope your weather clears up today.. it’s nice down here in CLT now! Your overnight OIAJ are making my first days of law school that much bearable…learning makes me hungry, thank god for a breaky that keeps me full till lunch!! Silly question, but do chia seeds have a flavor? I can’t get them where I am so I’ve been wondering! I don’t think they have any flavor. More of a texture and thickness. I think flaxseeds have quite a bit of nutty flavor, however. 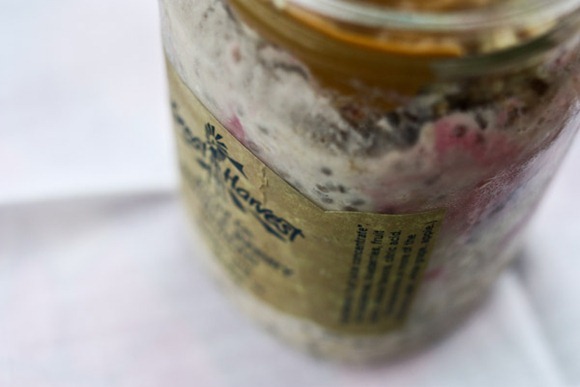 What a pretty jar of overnight oats. I am obsessed with cold oats… I don;t know if I will make the transition to warm oats this Autumn/Winter. I MAY however try savoury oats (with cheese and broccoli or avocado or eggs or something like that)… have you ever made savoury oats in the AM? Yes I’ve made egg/avocado kinds and also a goat cheese balsamic once. It was too much savory for breakfast! bees scare the heck out of me and I’m not even allergic! Good luck with that! And the oats look great 🙂 i’ve been too lazy to make them lately… I always feel too rushed in the AM! ahhh I would avoid that mailbox like the plague. I handle bugs just about as well as you do 😉 !! Eeek, I wouldn’t like a bee that big! Today I noticed a spider has made webs throughout the inside of my bar. Eeek again. Kath! First you got me to try “midnight” figs through your posts, and this morning I tried Coach’s Oats! They were VERY good– I don’t think I’ll go back to Quaker anytime soon. Ok that wasp/hornet story kind of freaks me out — I’ve never had a bug “look” at me like that! Hilarious. 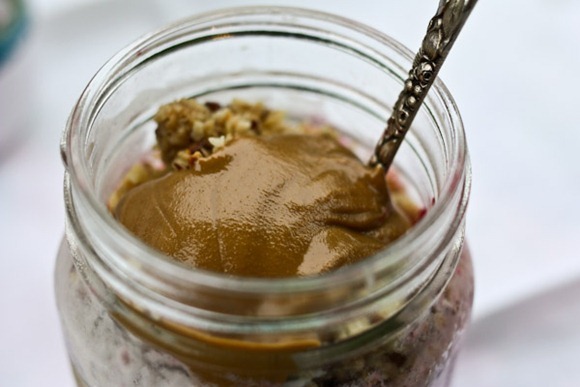 Mmmmm…oats in a jar are the best. Hope the packing is going well…good riddins’ Mr. Bee!!! Don’t pack him up for the new house!! That looks like dessert in a jar! Hope it clears up soon… Though seems like the storms keep coming. I bet he or she is a bug blogger! A colleague of sorts of yours. Yes! Kath we need a closeup. The bug wants to be famous. I spray unwanted bugs with air freshener to try to take them out or at least “intoxicate” them to stay away. Did you take out your “Eat More” sections at the bottom? I love that it is getting cooler here. I can’t wait to eat more oatmeal all fall and winter long. I only like my oats hot, so the cooler weather better get here quick!!! I like the pop of red in the jar! It’s dreary here today too, a good afternoon for some tea and a cozy blanket! So about your bee…it might actually be a cicada killer wasp. They are really big wasps (like 2″ big!) that do not live in colonies or wasp nests. They nest individually and eat cicadas. They are non-aggressive and non-territorial, so they’re usually not a problem to have around. My parents have a few of them and haven’t had any problems. Ashley, I was just going to post and suggest that it might be a cicada killer too! We just moved to North Carolina from California and I was completely freaked out by them until I figured out what they were. I swear they are as big around as my pinky finger. But my son told me that at school the other day they actually saw one dragging a cicada away! Music always helps with my mood! I need to do the same. The weather in Atlanta just won’t brighten up! Yum! That looks like such a filling breakfast choice! 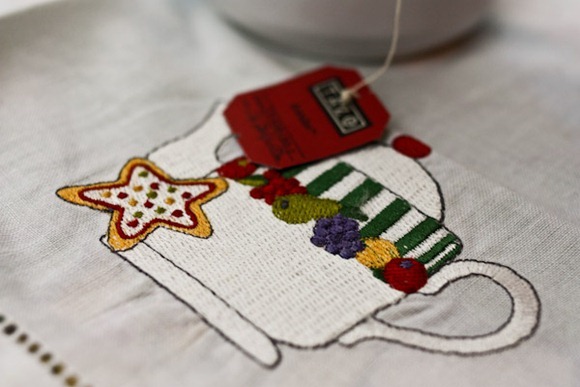 Love the needlework on the breakfast teapot linens. Is it hand stitched? If so, it’s fine work. Lovin’ that jar! And good call on some summer jams to chase these stormy clouds away! Yeah! I have a big appetite, and I don’t think it was as much as maybe it seemed? 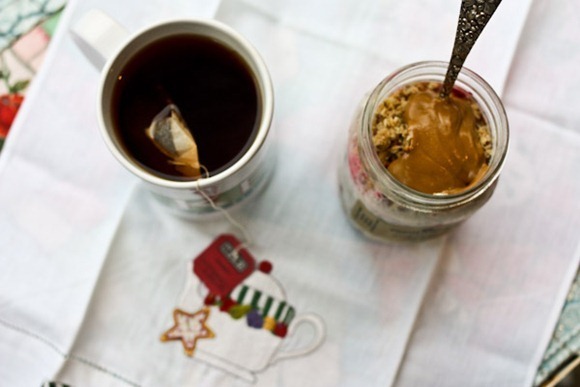 In NYC it was too cold to make overnight oats, even though it is barely September! If this “bee” (or hornet, wasp, evil creature) is giving you so much trouble, I wonder what your postman thinks of it!!! Well it’s not really our mailbox! And he’s not giving me trouble – just staring me down! I also put a note on the box so he/she would know not to go in there. OIAJ are the best! Ready for you in the am ad hold you over for a very long time. Those look perfect! You always have the cutesy linens Kath. That almond butter or sunflower butter looks so good and creamy! Eeeesh. That bee would give me nightmares! Put your battlegear on! I only needed one guess! And love the tea + teapot linen! I have been making overnight oats since I read about them on your blog. They are delicious. I’ve make them for my baby and he loves them! It is so great to be able to prepare it the night before and then breakfast is ready to go for my hubby to feed him in the morning. Now I’m curious about Chia seeds. 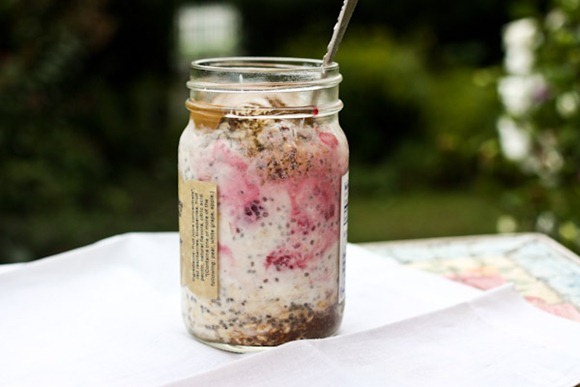 Are the Chia seeds added to the overnight mixture or do you sprinkle them on in the am? I was reading about some of the benefits and would like to try them for myself. Do you have a preferred brand? I mix them in so they gel up the mixture, but I also sprinkle them on top when I’m eating cereal or pancakes. You can do either. I get mine from Chiaseedsdirect.com because they are the cheapest there with free shipping. You can find them at Whole Foods in the spices too if you want to try them out first. They are most fun because of their texture! Why don’t my overnight oats look so pretty!! Did you ever have times in the beginning of blogging where you would just totally forget your camera or to take photos of meals? I feel like you are so good now at incorporating it into your life that it must be second nature. Do you have any tips for how to remind yourself to always take the photos or bring your camera? Your peanut butter looks so fluffy and delicious btw! I’ll be honest–if I had a wasp or hornet living in my mailbox, I’d NEVER go get the mail!! Don’t get stung!! mmm that would have been great this morning when I was running late for a morning class and woke up to find our toaster not working! I just had a bowl of overnight oats with almond butter this morning. So delicious and love how little work they require. Yummy! Do you mix in the frozen fruit the night before? how on earth do you eat that much in the morning? you must have a stomach of steel! I don’t think it was as much as it seems!? Just a normal bowl of oatmeal but in a jar! i didn’t mean it in a nasty way! i just don’t think my stomach could handle the carb-on-carb action going on there. i wish it could! breakfast is the best meal of the day! Well there’s also yogurt and milk! How are you scared of a cricket but not fully terrified of your mailbox bee??? I’m getting freaked out just reading about him lol. Breakfast looked good, hadn’t thought to try frozen berries in place of the banana in mine. Because the bee doesn’t jump up in my face! I discovered three mini hornets nests in my garage doors yesterday and I thought of your bee in the mailbox! Anyone have any suggestions on getting ride of them? Awake Tazo tea is one of my favorites!! Mmm overnight oats!! I havent made any yet as I dont even know where to start but all your pictures are so inspiring! it was chilly in chicago this morning! just finished a maranatha jar… can’t wait for OIAJ tomorrow morning!! Ugh – that wasp! Yikes. Be sure to tell the couple moving into your place about their “roommate”! Dang those look good, Ive gotta try them. We have that same kind of wasp!!! He lives somewhere near our front door, we don’t know exactly where yet because he only comes out at night. Like after 9pm. And then he just flies around and sits on our screen door. So scary, he is huge! I don’t go out my front door at nighttime!